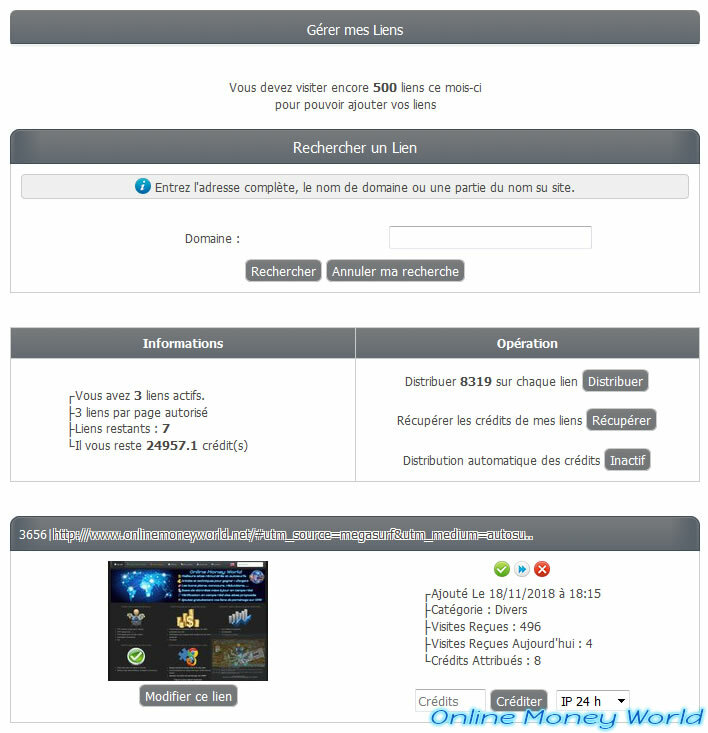 On the Internet, there are many French autosurfs, a small part of them work thanks to the Paleno autosurf script. for some of them : get free codes for other sites. This script was available for 5 € on the official website of its author (Paleno). Then, this script became free. Note that his site has finally disappeared, but since about twenty webmasters had obtained it, new autosurfs using the same script will still appear in the future. To begin, you will of course find a viewer for obtaining credits by visiting the websites and PTP pages of other members. As you can see, by default you have a ratio (on Cryptosurf) of 0.8 credit earned per visit. This ratio can obviously vary from one autosurf to another, even if the script is the same, because each webmaster will configure his autosurf as he want). If a site (or a promotion page) of a member poses problem in the autosurf, don't hesitate to click on the small red icon located next to the visited site to add it to your black list. You can also report it by private message to the webmaster of the autosurf concerned so that the site (or the PTP) is blocked completely. On the autosurf page, you probably noticed that a level was indicated. This level system allows you to earn bonus credits at each level change and again, the winnings and prerequisites of these levels may vary from one autosurf to another. Although some promotion pages are without IP control, most PTP often limit the number of paid unique visits to their PTP pages. Indeed, revenues from PTP sites are based solely on advertisements provided by different advertising networks. Depending on the requirements of these different advertising networks, the webmaster of the PTP used is obliged to credit you money only if he was able to earn money through visits received on these pages PTP. For this reason, PTPs often indicate : 1 visit per IP per x minutes. To prevent you from losing credits on autosurfs, Paleno has created an IP filter system that will send visitors to your PTP pages in compliance with these conditions. Most visits received on your PTP pages will be well paid for by the PTP you use. Note : if you have a website, you can also register on advertising networks that pay at CPM and add it on the autosurf with an IP filter of 24 hours. 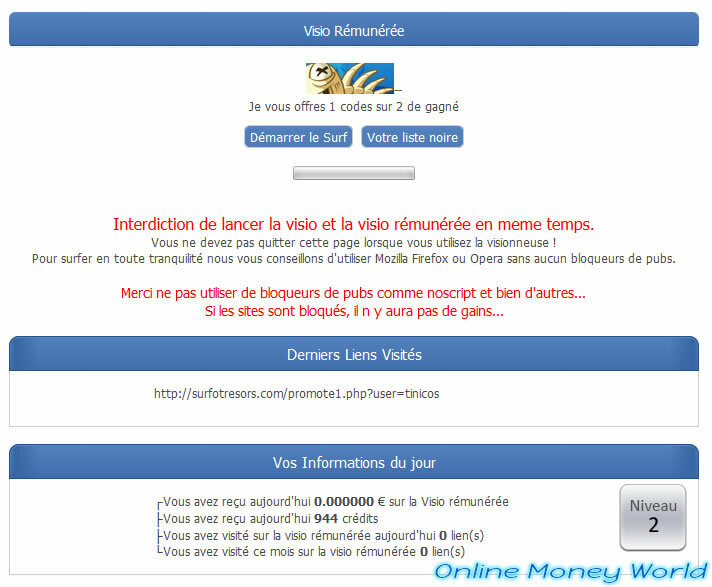 Thus, you will receive only unique visitors every day on your website and you will earn a little money thanks to the generated views. At the end of the day, don't forget to validate your different daily surfing bonuses (if the autosurf used proposes it). Finally, note that some autosurfs using the Paleno script also provide a paid viewer. This is particularly the case of Moncaosurf. 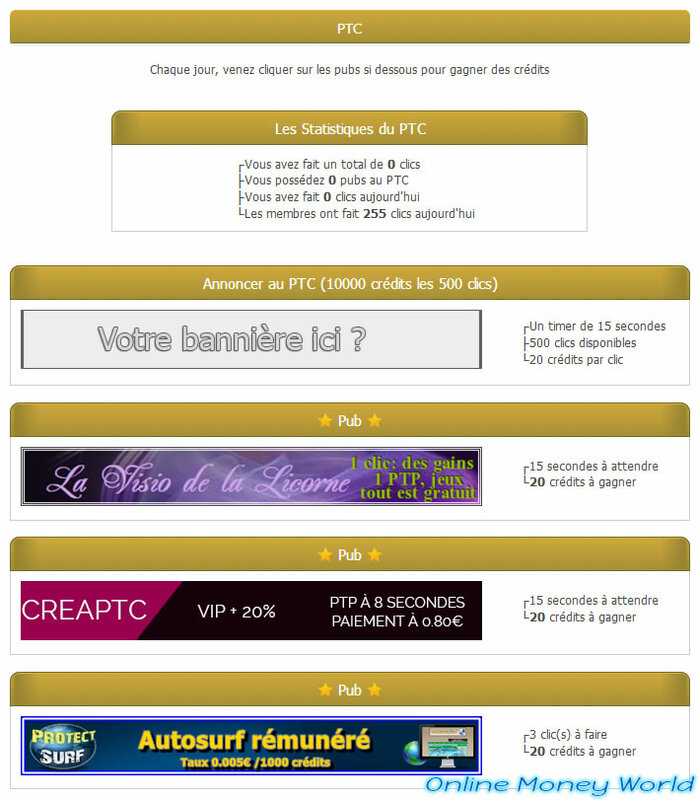 If you are looking for visibility, I strongly advise you to use the PTC which is available for free on all French autosurfs using the Paleno script. Adding your website in the PTC will give you more visibility if you want to promote your personal site or paid sites, indeed, members of the site will have to click on the banner and they will necessarily see your website. This is not the case of the viewer (autosurf) that you can leave running without even looking at the sites that are displayed there. Autosurf is therefore only useful if you need visits (for PTP pages or CPM ads) and not if you need real visitors who might be interested in the content of your website. On these autosurfs, you will always have the opportunity to buy a free campaign at PTC (even its price in credits will vary depending on autosurfs) to get 500 clicks on your banner. As you can see, by default, PTC clicks will be validated by members while waiting for 15 seconds. They will watch your website for 15 seconds before getting their credits. On some of them, you can also choose to have members validate your PTC ad by clicking instead of just wait x seconds. This option is available especially on autosurf-tranquille and Moncaosurf. On some of these autosurfs (including Moncaosurf), you will also find a paid PTC that allows you to earn money or points (depending on autosurfs) and also allows its webmaster to pay at least the hosting of his website. For the PTC Flux Regies, also available on Moncaosurf, these are clicks provided dynamically by advertising networks. On some of these autosurfs, including Cryptosurf, you will also get additional credits automatically based on the number of clicks you made each day in the PTC. The first module is a PTC loyalty card and it allows you to see in real time the latest bonus credits you earned through your clicks in the PTC. On Cryptosurf, this loyalty card will allow you to earn automatically 100 additional credits each time you make 10 clicks in the PTC. Note that these bonuses are cumulative so you can earn up to 870 additional credits each day if you make at least 50 clicks per day in the PTC. The last module to quickly obtain additional credits based on your activity in the PTC is the tomboclic. This tomboclic is available on surf2ouf and Surf-Malin and allows you to earn between 10 and 100 credits with each ticket. Knowing that you automatically get a ticket with every click in the PTC. As you can see, this tomboclic that will take you maximum 30 seconds a day will allow you to earn a few thousand additional credits in a short time.